Mussoorie, in Uttarakhand, is one of India's most popular hill stations established by the British to escape the summer heat. The first house to be built there was that of Lieutenant Frederick Young of the East India Company, in 1823, who used it when shooting game. Not long after, Sir Henry Bohle started India's first brewery in 1830. Indian royalty arrived later, with many maharajas constructing grand summer retreats (some are now heritage hotels) there. Mussoorie is set on a ridge about two hours north of Dehradun, where the nearest airport is located. Its easy accessibility from Delhi brings a chaotic convergence of tourists in the May to July peak season, causing traffic jams and delays. Hence, some people prefer to avoid visiting then. Here are the top things to do in Mussoorie. Get a bird's-eye view of Mussoorie and the Doon Valley by taking the red cable car up to Gun Hill from Mall Road. Gun Hill, at 6,800 feet above sea level, is the second highest peak in the area. It gets its name from the cannon that the British fired everyday at noon to help people know the time. Unfortunately, the commercialization at the top of the hill is a disappointment to some. Expect a hodgepodge of food stalls, souvenir shops, amusement rides, and local costumes to dress up and be photographed in. The cable car runs from 8 a.m. to 10 p.m. in summer (it starts and finishes earlier during the rest of the year). The journey time is five minutes, one way. The ticket office and boarding point are at Jhula Ghar, about midway along Mall Road. Tickets cost 125 rupees per person and are in very high demand during peak season. Like other hill stations in India, Mussoorie also has a Mall Road that runs through the heart of town. This lengthy pedestrian-only boulevard, which visitors gravitate to, starts at Library Bazaar and ends at Kulri Bazaar. It has a carnival-like atmosphere in summer when it's chockablock with people, shops, restaurants and entertainment. One of the main attractions is Jawahar Aquarium. However, those who are more interested in Mussoorie's colonial charm will find historic Mussoorie Library to be a noteworthy building. Unfortunately, it's only open to members. If you're the bookish type, make sure you have a drink at the renowned Writer's Bar at WelcomHotel The Savoy, just behind the library though. In addition, drop into the Cambridge Book Depot at the Kulri Bazaar end of Mall Road, which is a favorite of author Ruskin Bond. He's there every Saturday between 3:30 p.m. to 4:30 p.m. to meet fans and sign autographs. Feeling hungry? The best momos in Mussoorie can be found at Momos Tibetan Kitchen, a bit over 300 feet from Cambridge Book Depot. Nearby, travel-themed Cafe By The Way serves snacks and superb coffee. Keep an eye out for the murals depicting the region's customs on Mall Road as well. If you don't mind unruly crowds and unclean water, the man-made swimming pool at the bottom of Kempty Falls is the place to be in the peak summer season. Such is its popularity that it fills to capacity with hundreds of tourists. Kempty Falls is located about 8 miles northwest of Mussoorie. To get there, take a shared taxi from the Gandhi Chowk taxi stand near the library. Government tourism enterprise GMVN also operates buses from the Library Bus Stand and has an office next to it. Those who don't want to climb the many stairs to reach the waterfall from the parking area can pay 120 rupees per person to take a cable car (aerial tramway) all the way up. Changing rooms, lockers, swimwear and equipment hire are available at a nominal cost. Alternatively, those who prefer unspoiled natural beauty should give Kempty Falls a miss and go to Bhatta Falls or Jharipani Falls (while they're still secluded) instead. Happy Valley, home to around 5,000 Tibetan refugees, is a peaceful place to escape the clamor of Mussoorie and gain insight into the Tibetan way of life. This settlement was established by the Dalai Lama after he fled Tibet in 1959. The highlight is small but vibrant Shedup Choepelling Temple (also known as the Tibetan Buddhist Temple). It's surrounded by carefully maintained gardens and offers a spectacular valley view, especially at sunset. Other attractions are the magnificent golden Buddha statue atop the hill, and Tibetan school. The student's beautiful artwork can be purchased. It's possible to hike up to Happy Valley from the library end of Mall Road in about 45 minutes, or take a taxi. This informative private museum was founded in 2014 by yoga exponent Sameer Shukla and his wife Doctor Kavita Shukla, who has a Ph.D in drawing and painting, to preserve the heritage of the Himalayan region. It showcases all kinds of items related to the region's people including photographs of ancient rituals, paintings, sculptures, musical instruments, and handicrafts. There's a souvenir section as well. The museum is situated about 20 minute walk southeast of Kulri Bazaar. It's open daily except Wednesdays, from 10 a.m. to 2 p.m. and 3 p.m. to 5 p.m. Entry is free. Skip the dime-a-dozen shops on Mall Road and head to Himalayan Weavers for exquisite hand-woven shawls and scarves, made from natural fibers (wool, eri silk and pashmina) colored with natural dyes. Himalayan Weavers was set up in 2005 by Doctor Ghayur Alam and his British wife Patricia, who relocated to the area from Delhi. Their aim was to get locals to stop illegally picking medicinal plants by providing a market, and income, for their wool and handmade wool items. The business now supports many local weavers too. Patricia comes up with all the designs, and the wool is dyed in a room at the back of their house in Masrana village near Mussoorie (on the Mussoorie-Dhanaulti Road). The house also has a showroom, where the products are displayed and sold. It's open daily from 10 a.m. to 4:30 p.m. You'll be able to chat with the knowledgeable owners and learn about the weaving process over a cup of tea. The products cost more than those on Mall Road (stoles start from about 800 rupees and shawls from 2,000 rupees) but they're pure wool. If you're feeling energetic, a long (two hour) but scenic hike uphill from Kulri Bazaar will bring you to the highest point in the area, Lal Tibba (Red Hill), at about 7,500 feet above sea level. There's a cafe with an observation deck and high powered binoculars. Those who aren't fit enough to walk can ride a pony. West of Library Bazaar, you can hike up to surveyor Sir George Everest's House in about two hours for more outstanding views. Further along in the same direction are Cloud End and Echo Point—a private forested estate that you can enter by paying 50 rupees. Picturesque Camel's Back Road is a prominent thoroughfare that connects Library and Kulri bazaars. It has numerous viewpoints, including one across to a camel-shaped rock formation, and an old British cemetery. Want to spend more time in the great outdoors? Jabarkhet Nature Reserve is a special place! The reserve was established by conservationist Sejal Worah and landowner Vipul Jain, and is the first of its kind in Uttarakhand. A 110 acre, privately-owned and operated forest reserve, it opened to the public in 2015. Walking in its woods is wonderfully rejuvenating and reinvigorating. There are eight well-marked trails, each taking a few hours to cover. You'll come across all kinds of flowers, butterflies, and even mushrooms. The reserve is situated 2,000 feet above sea level, about 15 minute drive from Mussoorie on the Mussoorie-Dhanaulti Road. It's open daily from sunrise until sunset. The cost is 350 rupees per person. Guided expert walks, costing 500 rupees per person, are offered for those who are keen to know about the reserve's flora and fauna. Offbeat, bespoke walks can also be arranged. These include overnight treks and village visits. This sprawling municipal garden, named after the British East India Company, is popular with families. Young kids will enjoy the pedal boats, wax museum with statues of Indian and international celebrities, and assorted rides. There's also an artificial waterfall amid the flowery foliage. The garden is on the outskirts of Mussoorie near Happy Valley, on the way to Kempty Falls. It's open daily until sunset. The entry fee is 25 rupees per person, and tickets to the wax museum cost 100 rupees per person. Rides are extra. Even though Landour is only a couple miles from Mussoorie, the vibe there is totally different. 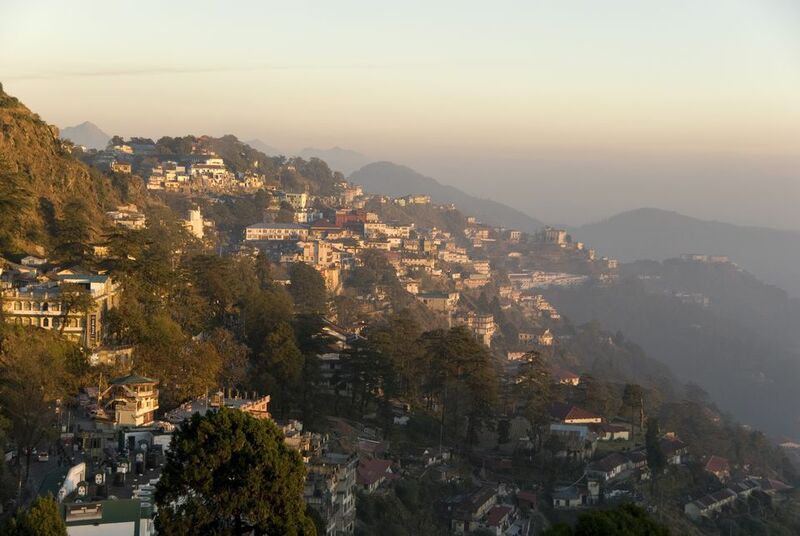 In stark contrast to Mussoorie's manic hustle, Landour has retained a distinctly refined British air. Silence is valued (and even demanded). The lack of rampant development, including commercial shops and hotels, can be attributed to Landour being a protected cantonment town. It was previously off-limits to Indians when the British occupied it. These days, it's best known for being home to a number of leading writers, the most famous of whom is Ruskin Bond (he resides in Ivy Cottage behind Doma's Inn). The main landmarks in Landour are its old churches, Woodstock School, and clock tower (which was demolished in 2010 but is being rebuilt). Homemade peanut butter, jams and cheeses are sold at A Prakash and Co store at Sister's Bazaar. Anil's Cafe at Char Dukan, near Saint Paul's Church, is the standout joint for Indian tea and snacks. The Landour Languages School is regarded as one of the best places to study Hindi in India. To find out more about the area's history, stop by the Mussoorie Heritage Center at Parade Point House in Landour (near the Clock Tower). It's open daily from 10 a.m. to 6 p.m. The iconic Mussoorie Writer's Festival, founded in 2005, formally evolved into the Mussoorie Mountain Festival in 2017. The festival originally concentrated on promoting Mussoorie’s literary heritage. However, it now has a broader scope—to be a "community celebration of Himalayan culture, natural history and exploration." A big focus is conservation. The three-day festival features talks, panel discussions, film screenings, music performances, storytelling, and photographic exhibitions. It most recently took place in March 2018, with dates for the next edition to be announced.